The bracket is very well made and fits the camera fine. However, when I use my Really Right Stuff ball head with the lever release mount, the arca swiss bracket only goes about 2/3 of the way on the bracket. It looks like the arca swiss fixture should be longer. I can't say enough good things about this bracket. This is my first L-bracket for a DSLR. My a7iii fits perfectly. The left camera strap hole is accessible via a notch. The battery door is fully accessible. The pre-drilled holes on the "L" and bottom allow a variety of attachments including a small grip. This allows for me to have something to hold and manipulate in portrait mode, or for when I am using a small lens like my 35mm prime. I can attach either a peak design anchor mount or just the PD anchor to the bottom bar designed specifically for it. Sliding this into my Sirui tripod head was a breeze. Once I got the camera leveled, it didn't matter which configuration, the camera was level. Shipping was faster than expected even if tracking was not updated enough. I got the bracket in less than a week. Just got my SmallRig L-Bracket for my A7RIII in the main today and first impressions are great. Its build quality is pretty much unparalleled with the product having a strong construction yet surprisingly light body. I'm confident that the bracket would provide good protection in the case of a drop. I was initially skeptical that the extra vertical depth of the bracket would add enough space for my rather large hands to grip but the ergonomics are perfect. While it's not pictured in the product photos, the bracket has sensor centering marks on the front and back. This feature is especially useful for people making parallax free panoramas, good job small rig! I can't yet attest to the accuracy of these markings yet, however. The bracket comes in at a very affordable price when compared to products of similar quality on the market. Highly recommended! Incredible build quality and design, fits perfectly to the camera. Very happy with the purchase! Well made for my Sony A7iii. Preferred SmallRig over RRS because didn't have to replace battery door. Light enough and arrived quickly. 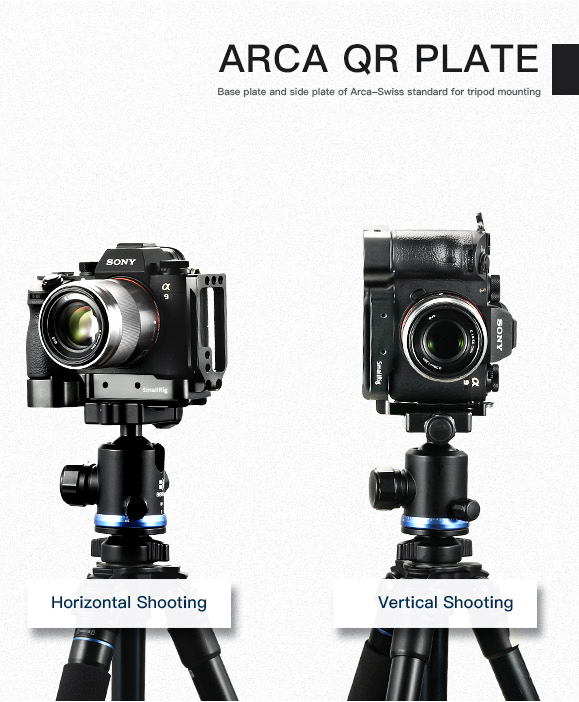 Used it for vertical and horizontal shots on Arca Swiss and had no problems. Liked the hoes in the front for mounting piece to support the Metabones adapter. The bracket looks great and feels sturdy. It fulfills all of my needs, for a larger grip, as well as vertical Arca-Swiss mounting. I would like it to be slightly lighter, by using aircraft grade aluminum, but would ignore that due to the very good price it currently sells for. The allen key is slightly loose in the mounting bolt, which worries me that either will wear out with too much installation and removal. 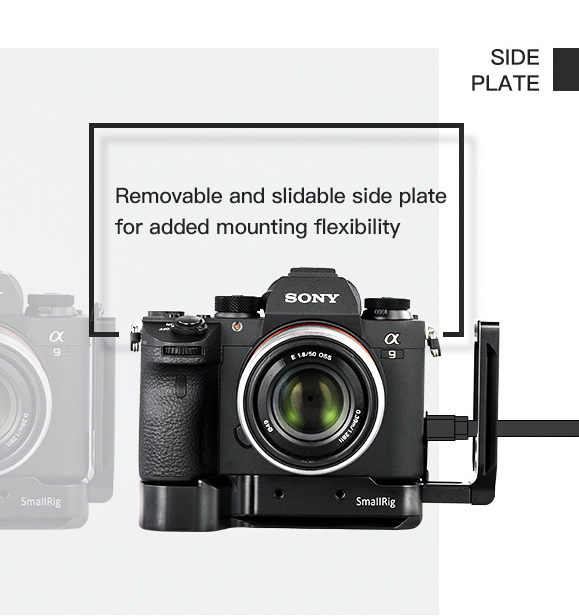 It should be noted that the bracket is slightly bigger than the needs of the Sony A7III, as it's sized to also fit the A9. Instructions should note that installation on the A7III should pull the bracket to fit snugly on the front, not the back. Impressively solid piece of equipment for my Sony camera. Easily installs on camera adding protection to modern delicate cameras. The Sony is a compact camera, but my hand is still the same size as my Neanderthal ancestors so the Smallrig adds much needed gripping surface. The slide-out L brace serves as an additional handle while carrying or shooting pictures. Not having to screw on or screw off tripod bases is definitely a time saver. By matching screws to the L brace, I can be as creative as I care to be, or I can take advantage of the compatible assessories provided for it. The fit to the camera has close tolerances and does not come loose under constant use. Buy it....you will like it. I was one of the first 50 to pre order this and have been very happy with it. I also preordered the a7 iii and when I got it i almost returned it the same day due to the ergonomics . I have bigger hands and the body only was just too small. RRS was just a tad too small and way more expensive. With this smallRig bracket I started to finally enjoy a wonderful camera. I originally took the side bracket off but then played around with it and find it very useful for shooting video for the extra stability and also useful for shooting vertical handheld when expanded. Also good job on the co design, Daniel Ockeloen. I watched your video about brackets for these cameras before this came out and liked your opinions and then to find out you helped design, was happy to see. The bracket is solid and well made. You can get to the battery and SD card slot with no problem. You need to slide the side bracket out some to get to the spot to plug in a remote or a microphone but it's doable. It is easier for me to put the SmallRig on my tripod than it was using the adapter plates. Very happy with my purchase. 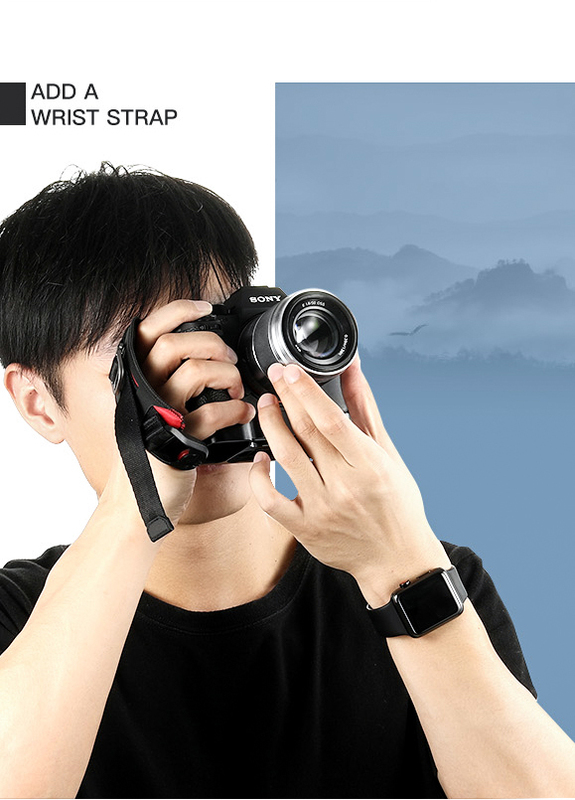 Awesome must have accessories for your A7iii/A7riii. Very well made and with precision. The extra 20mm make a huge difference in grip comfort. Great value too. Highly recommended! Super product with a great value for the money! The L-Bracket fits the camera well and blocks no access to ports and buttons of camera. It supports both horizontal shooting and vertical shooting when mounted on the tripod. Very well designed and the designer really has taken the needs of clients into consideration! Item arrived very quickly, was well packaged and included all you need to fit to your camera straight away including a nice little hiding place for the included Allen key in the base of the bracket. Makes the camera fit my hands much better now and great idea to make the L bracket for attaching to a tripod in portrait orientation removable so it doesn't get in the way or add extra weight when shooting handheld. 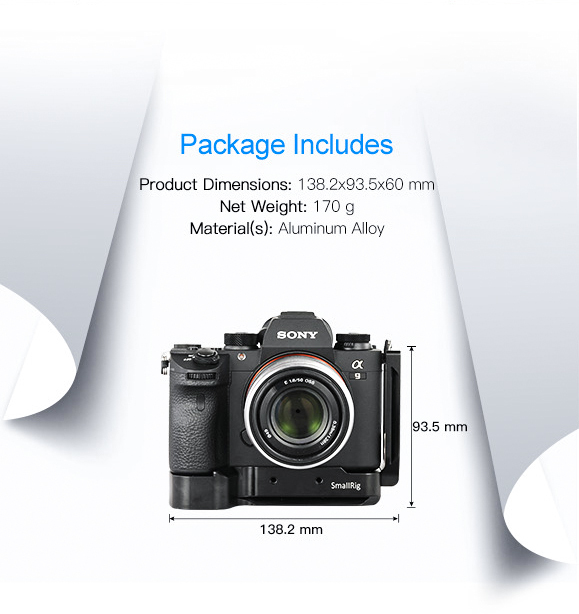 Recommended purchase for your Sony A7iii. Very well made. Very acceptable pricing. Nice and useful cooperation with Mr. Ockeloen. Thanks for his reviews and video's too. Fast delivery. Highly recommended. I am a little biased, but wanted to say great co-design work from the design team ! A must for big hands. Works fine as an L bracket and makes the camera much better to hold for those of Us with Larger Hands. Now if it could only make the finger well on the camera itself bigger it would be amazing. Excellent Product. I follow Daniel Ockeloen's videos, who highly recomments this bracket, So I brought one, and I must say, that on the first night I had it, I was doing some night shooting in very cold conditions, and being able to attach my camera via the builtin Arca-Swiss mount, to my tripod without removing my gloves was Amazing. Very solid product. Well Done SmallRid. Nice design, nice construction, good price. Allows for a better grip on the body, a place to rest your pinky finger. Versatile Arca Swiss compatibility. Highly recommend this L-bracket. 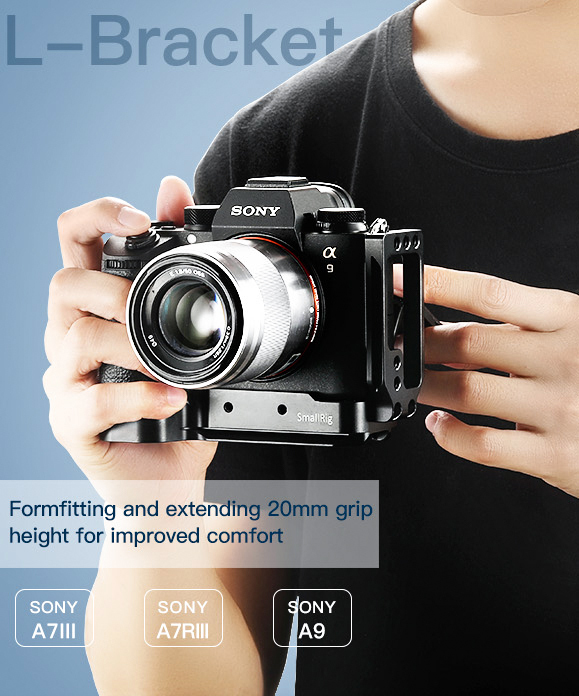 This L-bracket for Sony is an extraordinary, well-thought-out Arca-plate accessory plus grip extension. I was initially a bit skeptical about the design(s) but the team got the 'pinky-feel' adequately similar to the feel of the Sony Grip Extension, which I use when shooting without tripods. I'm not sure which existing HDMI clamp (if any) is compatible? But the more add-ons the better.